What is Certified Italian Cappuccino? Based on the experimental research carried out by the Italian Espresso National Institute, a high quality cappuccino that abides by tradition is made of 25 ml espresso and 100 ml steam-foamed milk. At the basis of a Certified Italian Cappuccino there is always a Certified Italian Espresso, that is an espresso made in conformity with the rules set forth by the certification required to obtain the mark Espresso Italiano. What kind of milk shall be used? The experiments carried out by the Italian Espresso National Institute produce clear evidence that the milk used for Certified Italian Cappuccino shall be fresh cow milk and have 3.2% minimum protein content and 3.5 % minimum fats. Italian cappuccino recipe: A hundred millilitres of cold milk (3-5°C) are steamed until they achieve a volume of approximately 125 ml and a temperature of approximately 55°C and then poured onto an Italian Espresso into a cup of 150-160 ml capacity. The Italian Cappuccino can only be obtained from a qualified blend processed by means of a qualified espresso machine and grinder-dispenser at the hands of a qualified barista. What is the Italian Cappuccino like? 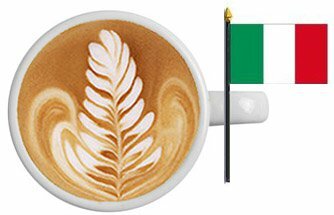 From a sensory standpoint, Certified Italian Cappuccino is of a white colour, trimmed with a brown edge of various thickness in the classical cappuccino, with decorations ranging from brown to hazelnut. The cream has a tight mesh with very fine or absent eye formation. The Certified Italian Cappuccino has an intense aroma combining the underlying scents of flowers and fruits with the bolder scents of milk, of toasted (cereals, caramel), chocolate (cocoa, vanilla) and dried fruits. Negative smoky and bio-chemical negative odours are absent. It discloses its remarkable body through an inviting sensation of cream and of high spherical perception, supported by a mild bitter taste and by a balanced, almost imperceptible acidity. Astringency is practically absent. It is a white feldspathic china cup, containing approximately 160 millilitres, the correct measure to contain 25 ml espresso and 100 ml steam-foamed milk (growing to a volume of about 125 ml). Cappuccino shall indeed be served in a cup that is full to the brim and its dome-shaped top shall be well in evidence. The shape of cups is important too, because the moment when the steamed milk is poured is the exact moment when coffee is incorporated, thus creating that perfect ring trimming the surface of classical cappuccino. Therefore, the bottom should be elliptical, of different thickness. The top, of adequate width, should have a rather thin edge to convey the idea of elegance.